Lynbee Navio, CSC-5 information officer, says government officials and employees should refrain from endorsing or promoting their favorite candidates during an interview over PIA-5’s Ugnayan sa Bikol radio program. 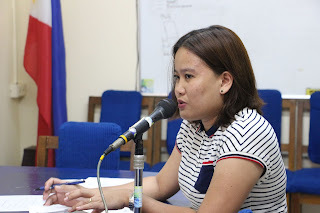 LEGAZPI CITY—If you see Civil Service workers endorsing or promoting their favorite candidates during the campaign period for the 2019 national and local elections, please report to the Civil Service Commission in Bicol (CSC-5).Lynbee Navio, CSC-5 information officer, says government officials and employees should refrain from endorsing or promoting their favorite candidates during an interview over PIA-5’s Ugnayan sa Bikol radio program. Lynbee Navio, CSC-5 information officer, said a joint circular of the CSC and Commission on Elections bans government officials and employees from endorsing or promoting candidates by posting on Facebook, wearing T-shirts or pins mentioning the name of the candidate, and engaging in other partisan activities during the election season. “We encourage the public to be vigilant against these prohibited acts and report to us, or to any authority concerned, if there’s government employee who violated the law against political partisanship,” Navio said. Navio said forming groups to support political candidate or party, holding political meetings or rallies, and making speeches or commentaries for or against a candidate are prohibited. Also included in the coverage of what government workers are liable for administrative or criminal are the giving or receiving any contributions for political purposes, and utilizing government resources such as personnel and properties for the campaign. “Directly or indirectly soliciting votes or pledges to support or defeat a candidate as well as becoming publicly identified with the success or failure of any candidate will be penalized,” she said. The prohibition, however, exempts the President and vice President, members of the Cabinet, elective officials except for barangay (village) officials, and members of the reserve corps of the AFP. Those who break the rules of political neutrality could be meted out suspension of one month and one day to 6 months for the first offense, and dismissal from the service for the second offense under the Revised Rules on Administrative Cases in the Civil Service, as quoted by Navio. However, Navio said the government is not banning its employees from liking or reposting status updates from a candidate or political party’s social media site.